Lots of sports need us. We keep time and make sure everyone follows the rules. To paraphrase Rodney Dangerfield, we get no respect. Our uniforms are extremely recognizable, partly because thousands of Foot Locker employees have chosen to dress like us. We’re referees. There are countless numbers of referees throughout the country working in sports like soccer, volleyball and basketball. They monitor everything from peewee league games to international level events. While there are a large number of referees; very few will ever become professional referees. Professional referees are vital to establishing and maintaining order and fairness in competition. They are typically lovers of the games they officiate. They are required to have a thorough understanding of the rules of play, an ability to physically and mentally follow and control fast-paced games, and the authority to withstand challenging athletes, coaches and fans. They have to be tough. Professional referees aren’t required; however, to have played the respective sport for which they referee and or to be or any particular gender. This leaves the profession open to men and women alike. While the criteria means there’s room for diversity, the overwhelming majority of professional referees are male. By way of example, there are 62 staff referees in the NBA, 30 in the WNBA, 119 in the NFL, and 77 in the NHL. Of those 288 professional referees, only ten are women (nine of those are from the WNBA and one from the NBA*). While these numbers may seem shockingly low, they actually aren’t that surprising and there are signs that the numbers may soon be on the rise. It’s no surprise that there are relatively few female professional referees because female participation in sports has historically lagged behind males. While females have played sports of all kinds for a very long time; they have done so, especially at the professional level, at a significantly less involved level than their male counterparts. Sports observers know that female referees tend to more frequently officiate in female sporting events than in male sporting events. It then makes sense that there would be fewer female referees since females have yet to play sports at a rate consistent with that of males. Additionally, it’s no secret that female viewership of sporting events has lagged behind the viewership of males, meaning females have developed a fan base and thorough understanding of sports at a slower rate than males. A genuine love for and thorough knowledge of the sport in which they work are key attributes for referees; so until more females develop those attributes, there will be significantly fewer female referees than male referees. While professional female referee numbers remain low, I believe that the continued ascension of female participation in sports, as athletes and fans, will bring an increase in female professional referees. And there are already signs of improvement. 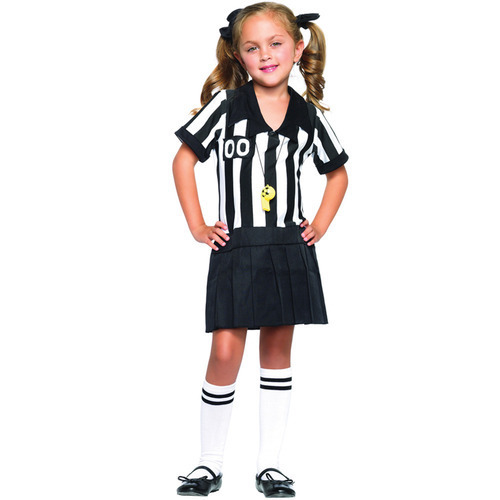 In football, the NCAA has a number of female referees. In fact, earlier this year four women refereed a Division II game between Miles and Lane Colleges, making it the first time that a NCAA football game was officiated by a majority female crew. And the Fight Hunger Bowl (to be played on Dec. 27, 2013, between Brigham Young University and the University of Washington) will be the first Division I game to feature multiple female referees. It also appears that in 2014 the NFL may name Sarah Thomas (the first female NCAA football official) as its first full-time female referee. These are promising signs that the novelty of female referees will soon wear off as more and more make their presence known on various fields of play. So be patient my friends, you’ll soon be able to yell and swear at female refs just as much as the male refs. *The one NBA referee is Violet Palmer. She has been a NBA referee since 1997 and the sole female since 2002.